At once dynamic, exciting, and extremely self driven, Cairenn Foy started her line of children's clothes in 2016. In the short time since launching, her clothing is stocked in no less than 17 stores and she has been shortlisted for Image Businesswoman of the Year. Cairenn has done this whilst being a mum to two young children and a third on the way. I am humbled by her motivation! The ethics behind her clothing are as important as the designs themselves and in the current global climate, this is a modern business model for success. Thanks Cairenn for taking the time to share your story with us about business start.up in Ireland, daily motivational mantras and favourite places to go in Ireland. You can also catch up with Cairenn on her website, instagram, twitter and facebook. - You travelled a lot when you were growing up. Can you tell us a little about your childhood and your dreams for the future? I started school in Copenhagen and lived there for nearly 5 years, so leaving Denmark was a very sad time for us all, as we really loved living there. From there we moved to London for just over a year and a half and then came back to settle in Dublin. During transition year in school, I went to a boarding school in Bordeaux as my Mum felt it was a better use of the year to learn a language, so off I went! My Dad's job involved a lot of travel, so as children we were constantly moving houses, schools and countries. On a positive note, we got to experience a lot of new cultures, and places at a young age. My aspirations for the future are to continue expanding the company but achieve a better work life balance, as its not quite there at the moment! - Where did the inspiration come from to set up a line of children’s clothes? Having studied a degree in European Business and Languages and having spent over a decade working in Sales and Business Development in large Blue Chip companies, I was more than ready for a change. I had always longed to do something more creative, but like many unsure school children filling out their CAO forms I was encouraged to do a broad degree as a good grounding base. I had always craved to do something creative and wanted to get into buying or interior design when I initially left school, but somehow ended up in sales instead. Looking back, I think this was exactly what I needed as I was desperately shy and anyone who works in sales will let you know that you are forced to come out of your shell and sink or swim. After a decade working in large Blue Chip companies where travel was a huge part of my job, I was absolutely ready for a change. Having 2 children in quick succession (Irish Twins) I decided to leave the corporate world. My first stepping stone was educating myself in an area I fundamentally had no experience in, so I joined the Grafton Academy to study a course on Fashion Design and whilst doing that I bought a really interesting book called Fabric for Fashion and would assign myself a chapter a week to study. I absolutely loved going up to the top of the house and sitting down and reading about all the different variations/origins of fabrics like cotton and silk. I wanted to ensure I could have an educated conversation with factories and fabric suppliers once I started getting my samples made. Having my daughter who suffered badly with eczema was another catalyst in starting my company. I was really disappointed with the quality offered on the market, even by the ‘luxury big brands’. I wanted to focus on creating a brand that was not fast fashion, that was ethically made, and used only natural breathable fabrics in styles that were very traditional, timeless and elegant. - Setting up a fashion line is a challenging business! When did you start out and can you tell us a little about the process? I would imagine setting up any business from scratch is hugely challenging, and hats off to anyone who puts themselves out there, as it is incredibly difficult and can be very daunting and isolating. You really do an enormous amount of learning on the job. After leaving the Grafton Academy, I had my first samples made in May 2016 and by September 2016 I had my first order with Avoca and another retailer. There was a huge amount of business development required from my side and persistence, and trying not let the negative little voice in my head get any air time. We launched officially online on 1 February 2017 and stock went into brick and mortar stores on the same day. Thankfully, we had an amazing response to the brand and we back-filled orders as early as March. I do think the success of the brand so far is based on the quality of the product. I put an enormous amount of time into travelling and sourcing the very best of fabrics and then work to designing dresses that are traditional, timeless and elegant but still selling at an affordable price. We only work with natural breathable fabrics, so I import my embroidery anglaise from France, my silk velvets from the UK and I work with a lot of local fabrics like Emblem Weavers using their Silk Wool. From the outset I have made a conscious decision to have my garments ethically made using only the best quality fabrics. This has naturally come at a high cost to me and means I am always under pressure trying to manage margins whilst not compromising the quality of my brand. - Since you started out in 2016 you have achieved stellar success in a short time, to what do you attribute this success? I am very driven and I think years of working in sales and business development has really stood to me. Each account I have is as a direct result of business development - there have been no ‘Introductions’ or a friend of a friend knows someone in Buying, so really I think resilience is hugely important. When someone doesn't respond to an email or a phone call, try them again, do not give up so easily. On a personal note, I have sacrificed a huge amount to grow the brand from 5 brick and mortar stores to 17 in less than 8 months. I am absolutely thrilled to have my brand stocked in all of the Avoca Stores, all of the Brown Thomas Stores and select boutiques nationwide. My business is very much an extension of myself and I do see it as the fourth baby I never had (3rd is due shortly!). - As a working Mum, how do you plan out your days? How do you keep a work life balance? It's so tough trying to balance everything and anyone who tells you it is not is lying! When I first started this business Ava was 1 and Connor was 2 and my husband had just set up a business and had also decided to run in a local election as well so it was absolutely insane. Looking back the question "why would you do that to yourself?" springs to mind, but I did and here we are :). I really only have a limited time in the morning to work - so really 3 hours, and then if I can get them down in the evening I will try and squeeze in another 4 hours. Most days my ‘to do list’ is never completed and I just have to accept that and say I've done my best today with the limited time I have and it is what it is. The kids are so young and grow up so fast. It's lovely to be able to pick them up in the afternoon, so even if full-time childcare was an option, I would still prefer to work in the mornings and late in the evenings so that I can be with them in the afternoons. - Did you find a lot of support in Ireland to set up your own design enterprise? DCCOI have a great lady called Emma McGrath who meet with me a few times and the more you chat to people about what you're trying to achieve, the easier it becomes to get advice or a contact. I certainly wouldn't have made it this far without people kindly offering a name or contact of someone who might be able to advise me on a certain issue I was having. - You describe the style of your brand as timeless, elegant and traditional. What resources do you seek out for inspiration for your designs? I was a huge fan of Shirley Temple growing up, to the point that New Kids on the Block were huge and I had no idea they even existed - slightly embarrassing really… I idolised Shirley Temple's style and learnt to tap dance from 3 and did it right up to about 14. I absolutely love watching old movies especially from the 20’s and 30’s were the little girls have there dresses that fall above the knee with peter pan collars and short puffed sleeves. I always pull my inspiration from the past, whether it's designing dresses or decorating my house. When I buy fabrics I buy because of the texture, I always have to touch fabrics and textures. I buy prints that evoke emotions of past memories, and then work to incorporate them into a collection. When I did showcase in January 2016 it was lovely meeting people who would stop and talk about childhood memories that were being evoked because of the style and patterns of dresses they were looking at. It was really touching. 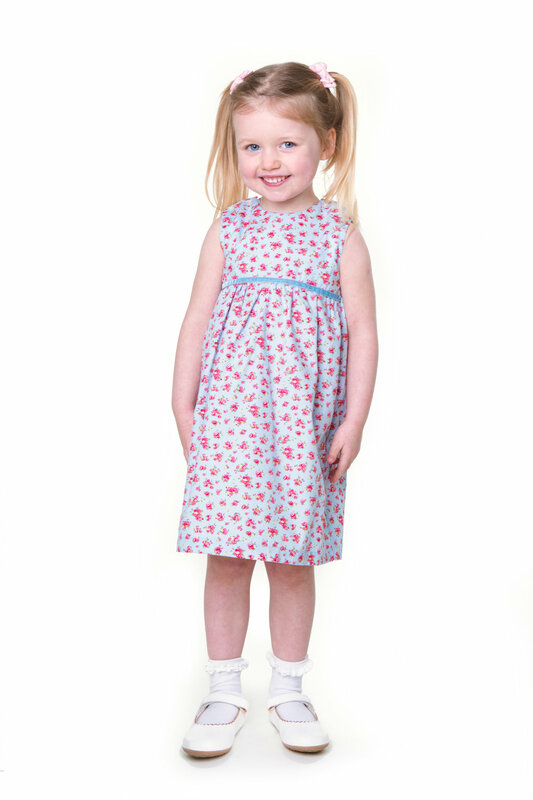 - Do the styles in your line of children’s wear reflect your own personal style ethos? Absolutely, when I shop for myself, which is not often, quality is the No.1 thing I am looking for. I only wear natural breathable fabrics too, as I suffer with eczema, so wearing nylon and man-made fleece products is the equivalent of wrapping my skin in cling film. I always try to make a conscious decision to shop local as well, from the food we buy, to books or interiors as it's really important that I support local Irish business in my community. - 2017 has been a big year for you with features in the Irish Times and a shortlisting for Image Businesswoman of the Year. What are you looking forward to in 2018? 2018 will be a busy year too, we are welcoming a new member of the family in February, so we will have 3 little munchkins under the age of five - pray for me! And as far as the business is concerned we will be showcasing abroad and have extended our range, so I will be excited to unveil what that looks like next year as we are in sample stage at the moment and finalising this particular new range but I am really excited about it. - What advice would you give to school leavers looking to set out on a career path in fashion design? I suppose without sounding like Debbie Downer Its incredibly tough, it is not glamorous, design is a small part of running your own business so get as much experience behind you as possible and work hard. In any industry you are more likely to succeed if you put in the extra hours and don't get disheartened when you get set-backs. We all get them and we will all continue to get them, learn from them, dust yourself off and move on. 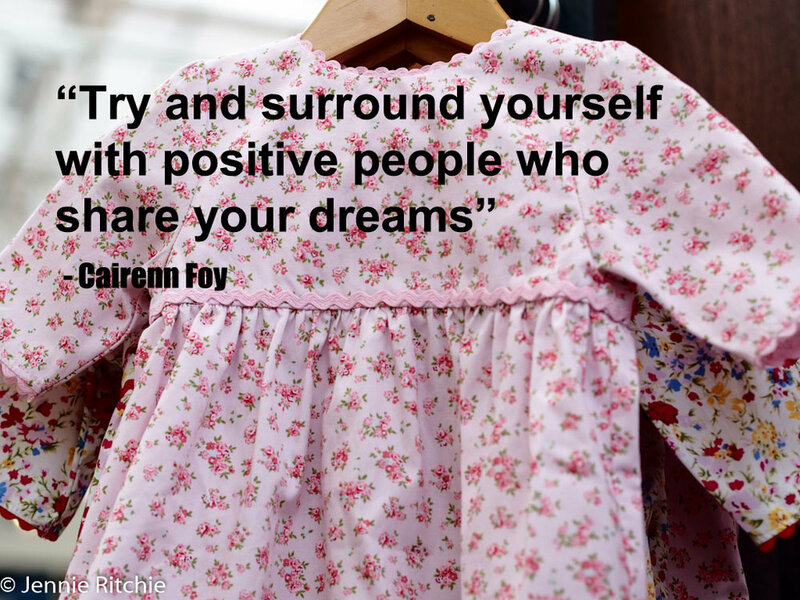 Try and surround yourself with positive people who share your dreams with you, if you can't do that there are lots of great business podcasts and books out there by people who have succeeded and built great businesses often coming from nothing and having to overcome huge adversaries. I am reading Jo Malone's biography at the moment and loving it. I also have a few quotes from Churchill, that I refer to when I'm facing a tough situation, posted to my desk! - In Ireland where are your favourite places to visit? I visited Killarney National Park at the end of last summer and absolutely fell in love with it. It was breathtaking and I cannot wait to go back again. - Do you have a favourite local café or restaurant that you love? I am more of a home bird, so to be honest I am happiest with a roast, a large glass of red wine sitting by the fire and binge watching The Crown. At the moment, I am in full-blown nesting mode as well as running the business so I don't go out that often, but when I go out with my girlfriends I love Coppinger Row - it's super buzzy and they do great cocktails. - What does a Sunday morning look like in your home? My husband takes the kids out to sports and I will try and get a shop in and tidy up so we can walk into town after Gaelic and soak up all the art on Merrion Square. I bring the kids into the National Art Gallery where they have a section cornered off for kids to colour, after that we head to the park, pick up the papers on the way home, light the fire and sit down for a roast before the dreaded bed time madness kicks off!